Looking for Certain Dinnerware Patterns? 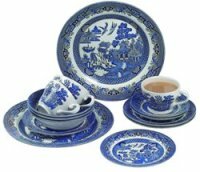 Most people like to choose by dinnerware patterns, especially if they are matching sets. For instance, if you want Royal Doulton fine china, you would search for a pattern, like Old Country Roses. It is the world's best selling china pattern. For something more casual, you might like the Carmina pattern. If you are looking for a particular pattern, but don't know the name, pattern identification services can be useful. 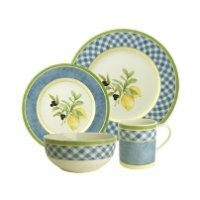 Once you know the name of pattern, it is pretty easy to find dinnerware sets or replacement pieces on the internet. If you are collecting dinnerware, it is best to consult a collector's guide to learn all there is to know about the pattern, including time and place of production as well as back stamps. I'm looking for service for 12 (48 pcs) of this pattern. Thanks. Have a very full 8-piece Royal Albert English Rose dinner service, c 1940 Canada. What is value? Is it saleable? set of four stoneware salad/dessert plates, Sakura Inc. If you are looking for a particular pattern, be sure to search this site using the pattern name. Over time, this site will present most styles and a variety of patterns.